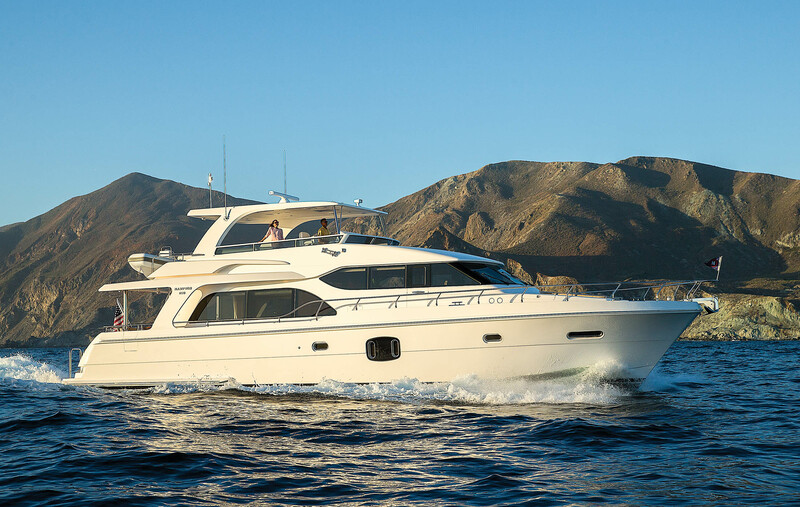 Filling a gap in the PH lineup, the semi-custom 650 is a luxury couples cruiser with history on its side. OK, I thought as I peered through my zoom lens at the Navy’s newest autonomous submarine-hunting trimaran being tested in the waters off Camp Pendleton, it’s pretty badass, but can it take me from Southern California to Alaska in comfort and luxury with only one fuel stop? Don’t think so. 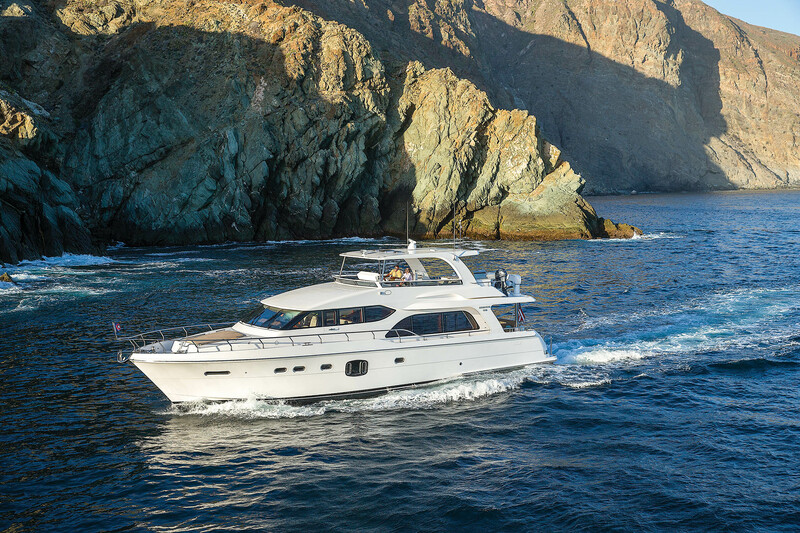 Aboard the new Hampton 650 Pilothouse — which certainly can get from SoCal to Alaska with one fuel stop — on a run from Newport Beach to San Diego were myself and Hampton Yacht Group of California’s Chris Elliott and Michelle King. Elliott and King were delivering the yacht to the San Diego International Boat Show, and I was along for the ride, a bit of an extended sea trial. Coming across the Anti-Submarine Warfare Continuous Trail Unmanned Vessel (ACTUV) was a bonus, one that led me to the H650’s spacious and social flybridge. But I’m getting ahead of myself. Hampton was sure to keep the hull design elements that make its yachts seaworthy and safe — hand-laid fiberglass molded in one piece with five outer layers of vinylester resin and reinforced with two layers of Kevlar from chine to chine and a third Kevlar layer in the forward collision zone — but the Howard Apollonio design added something to the modified deep-V concept. The chine is split. The forward half of the chine on both sides is above the waterline, to improve performance at slower speeds, and it fairs about halfway back. From there aft, the chine is below the waterline, which helps at planing speeds. Overall, the split chine nearly eliminates chine noise at rest. 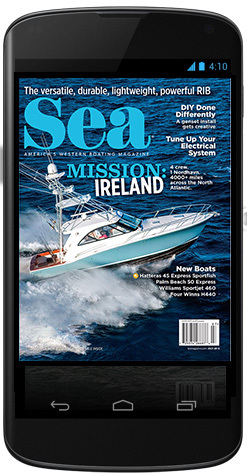 Add in prop tunnels and new Caterpillar diesels, and it all results in a 66-footer that can achieve 23 knots, which was our top speed on test day in a gently heaving Pacific Ocean, amid three- to five-foot swells. 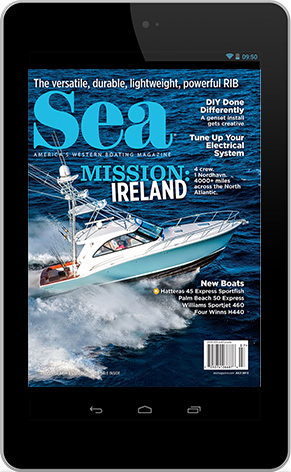 With the ABT hydraulic stabilizer fins engaged, the ride was smooth up and down the speed range, even when we took the swell on the beam, and even down at trawler speeds, which is where the 650 will spend a lot of its time during long passages. At 9 knots, roughly 1000 rpm, the twin Cats were burning a combined 10 gph, which yields a range of just less than 1,000 miles (with a 10 percent reserve built in). Seven or 8 knots will push that range past 1,000 miles. Range at 15 and 17.5 knots is roughly the same at 295 miles, and the fuel burn is 55 and 64 gph, respectively. Elliott called 19.5 knots a fast cruise, which had the engines spinning at 2050 rpm, about an 80 percent load, and burning a combined 76 gph. The deep V of the bow cleaved the waves and kept conditions comfortably smooth for the H650’s three passengers as we made our way to San Diego at 17 to 18 knots, while the flatter aft planing section and the props threw off a wake the dolphins found irresistible, as four pods of them found us along the way. We spent the trip at the lower helm on a cool, gray, damp early summer day — June gloom in full effect — though I made it up there to record a short video and photograph the Navy sub hunter, but when the weather is good, the flybridge will be the preferred hangout spot. Accessed via steps from the aft deck or opposite the galley, its helm is fully outfitted with twin Garmin MFDs, engine displays, a VHF radio and controls for the engine, thruster and stabilizer fins. Twin captain’s chairs face the helm but can swivel around to join the action at the L-shaped dinette. A console to starboard houses a grill, a refrigerator, a sink, a wet bar and storage. Aft is room for a dinghy and a davit. 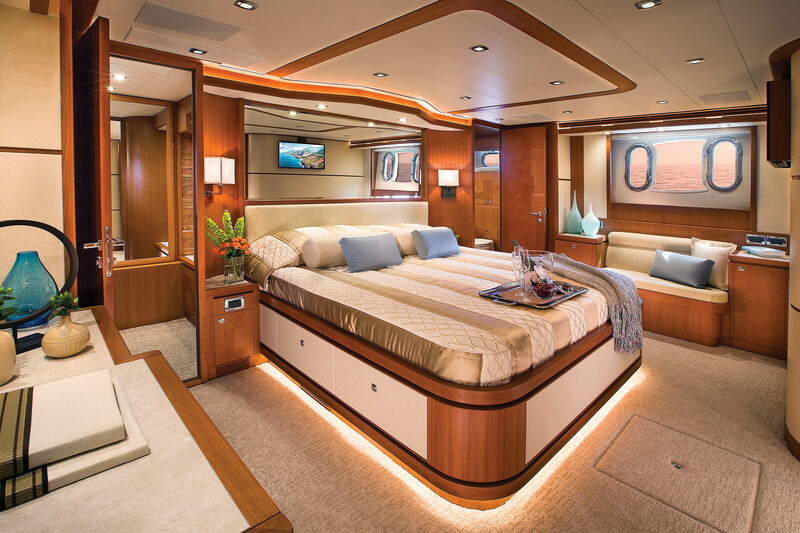 The hardtop covers the flybridge from the helm to the back of the settee, and an LED TV folds down out of it. A pretty neat feature. Hampton designers have spent a long time tweaking the pilothouse concept, and the H650 and its owners benefit from that work. The satin cherry woodwork is warm and pleasant to look at and complements the granite countertops perfectly. 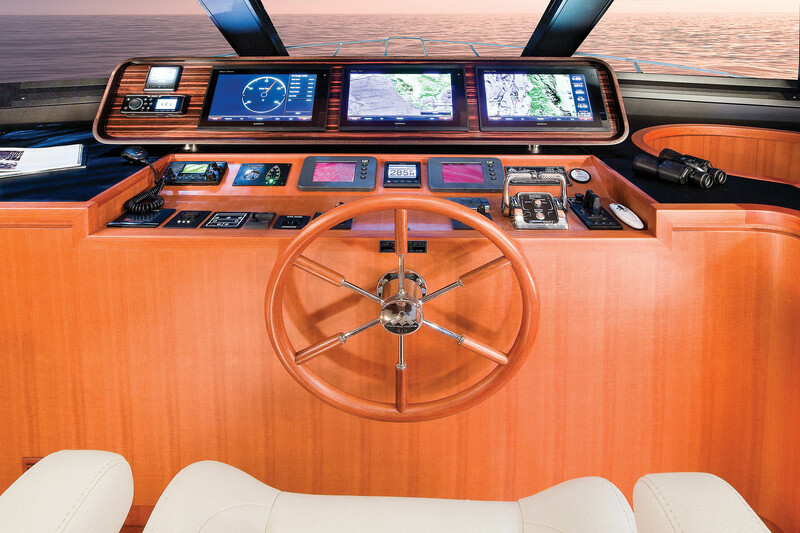 Twin Pompanette captain’s chairs front a helm that’s composed of an angled lower dash component — engine displays, throttles, a VHF radio, an autopilot display and more — and a wide, soft-cornered “pod” that faces the driver and appears to float just above the dash. Within that burlwood-accented pod are three Garmin GPSMap 7616 MFDs, a Fusion stereo head unit and a Garmin GNX instrument display. While the pilothouse is definitely built for safe and functional operation of the yacht — a four-panel windshield and windows all around deliver expansive views and watertight side doors provide quick access to the sidedecks — the captain won’t be cloistered away while driving. A three-person settee is immediately aft of the captain’s chairs, and those chairs can swivel around to join in for a meal at the hinged table. 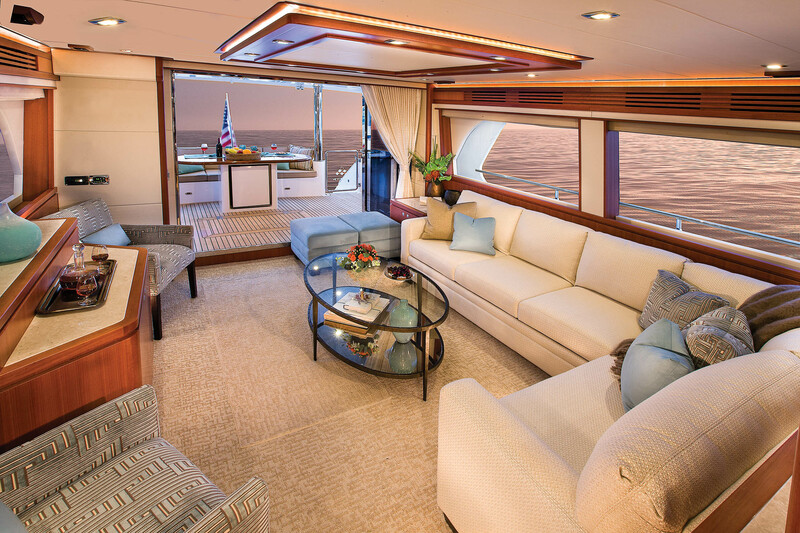 Directly aft of the dinette is the U-shaped galley, which is open to both the helm area and the salon, which is aft and down three steps. It is fully equipped with GE and SubZero appliances, a pots-and-pans drawer, overhead cabinets and a granite sole with optional heat (enough to keep feet warm on a cold morning, I assume, not enough to fry an egg). 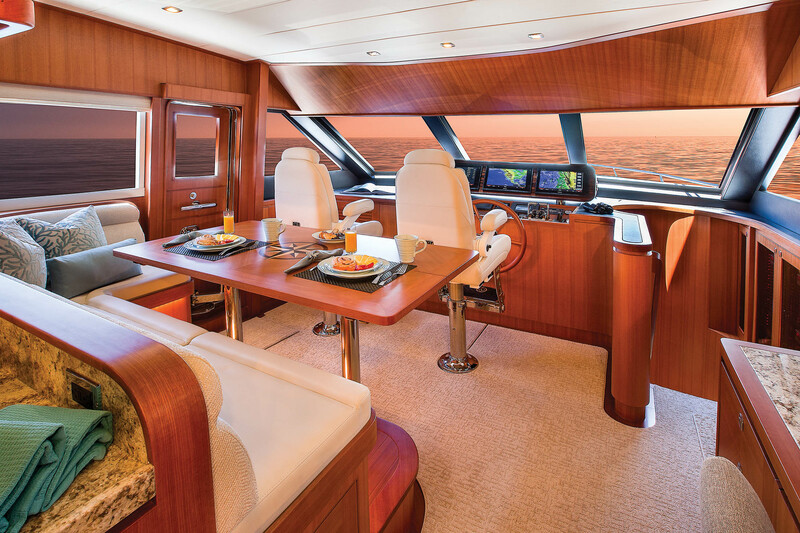 A desk that can double as a serving station sits opposite the galley, to starboard, at the base of the stairs to the flybridge. Folding glass doors at the aft bulkhead mean the owner can open up the inside entirely to the aft deck, or just a little. 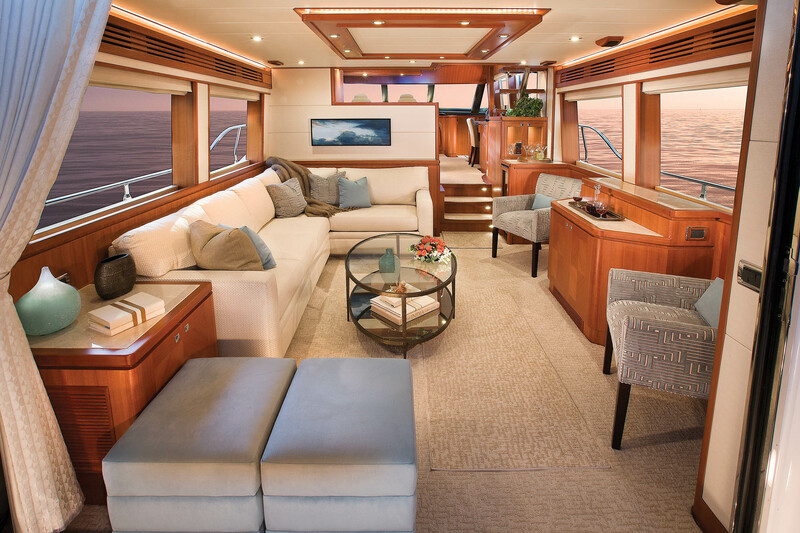 With the doors folded completely away, the aft deck and salon become one large social space, with room for at least six people inside on the L-shaped sofa and twin armchairs and room for four or five on the transom bench settee, which shares the space with a table that houses a small refrigerator in its base. The flybridge deck extends far enough to turn the cockpit into a California deck, and stairs to either side lead to the large swim platform. In the salon, a two-level cabinet to starboard houses a high-low TV in the upper part and a bar in the lower part. Another cabinet forward of that is home to a wine refrigerator. Two ottomans and a moveable glass coffee table make this social space adaptable and configurable. The windows that run along both sides of the salon bulkheads are at such a level that passengers can see out while they’re seated. A curved stairway leads to the accommodations below, where passengers will find three staterooms and three heads. The foyer houses a washer and dryer and a storage closet. The third stateroom features a full-size bed, reading lights, an LED TV, a hanging locker and a stereo/DVD player. The VIP stateroom includes an island queen berth, a hanging locker, an LED TV, a skylight with a screen, storage, a stereo/DVD player and more. Both the VIP and third head include a separate shower stall, granite countertops and floors, a Tecma toilet and a vanity with under-sink storage. Spanning the full beam, the master stateroom is an owner’s retreat. A king-size bed is on the centerline, a two-person settee is under the large hull window to port, and a vanity is opposite, under another hull window. Both hull windows have two smaller opening portholes. Aft of the berth are the head, shower and walk-in closet. The toilet and vanity are to port, with the shower stall on the centerline, and the large closet is to starboard. Having the head and closet aft of the berth definitely helps with sound attenuation, and even with the boat underway, people could sit and converse comfortably on the bed or the settee. Overall, the workmanship on the H650 is exceptional, which one might expect from a family that’s been building boats for roughly 50 years, the last 24 of those under the Hampton name. The woodwork is flawless and tightly joined, the built-in furniture fits exactly as it should, the stainless is smooth and shiny, and the engine room is well laid out and roomy. While some owners are going to want to get out there and go, I can definitely see this yacht being used to take groups around the harbor, to the islands for the day or for lunch somewhere in the sound. Its biggest strength might be as a floating happy hour spot at the dock, though given its 1,000-mile range, it doesn’t necessarily have to be its home dock. During our several-hour trip to San Diego, I sat in every part of the yacht and just listened. The whooshing of the water past the hull and the low hum of the Caterpillar diesels was the soundtrack. I didn’t hear creaking from the hull, the sole or the doors. Nothing rattled and water bottles set down on tables and countertops didn’t move. We did get a close-on visit from a military helicopter that was protecting the perimeter around the ACTUV sea trial, but he might have been as interested in checking us out as we were in checking out the sub hunter. LOA 66 ft., 4 in. Beam 17 ft., 8 in. Draft 5 ft., 2 in. See dealer for complete list. 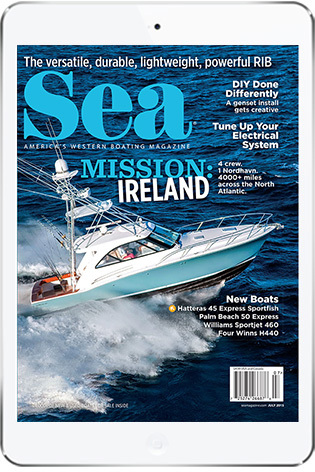 This entry was posted in Boat Tests, Featured, New Boats and tagged motoryacht, Pilothouse, hampton by bsheehy. Bookmark the permalink.